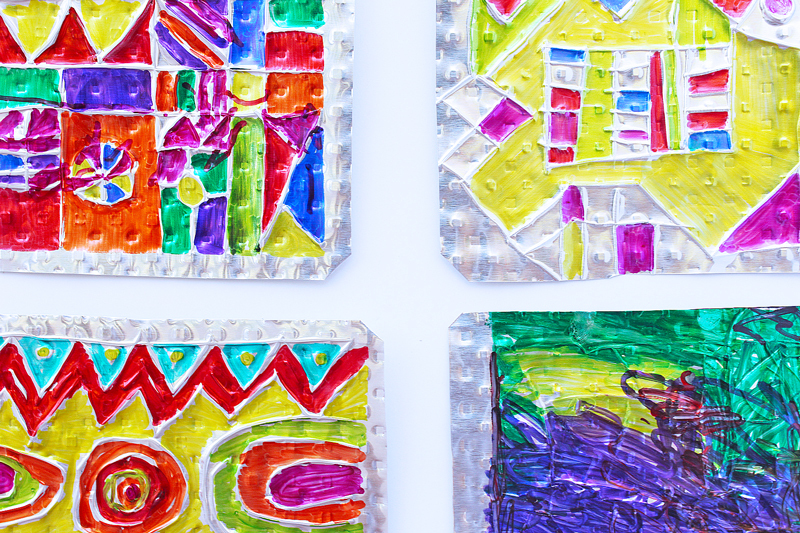 Today’s folk art project for kids is based on a form of Mexican folk art commonly referred to as Hojalata, the Spanish word for tin. Folk art is proof positive that everyone is creative. You don’t need special training or classes to be creative, you just need the willingness to try something different and look at the materials around you in a new way. 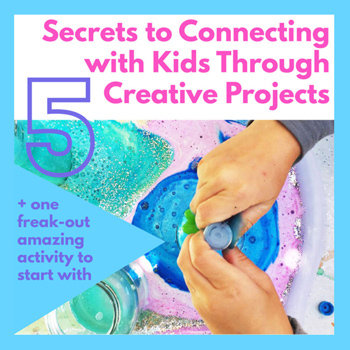 If you have a child (or maybe you feel this way) that is particularly prone to self doubt when it comes to creating, try taking a look at examples of folk art. Folk art is created by everyday people who make wonderful, amazing art pieces with simple, often discarded items; it’s art form that teaches us to see the objects around us differently and not rely on special materials or training to be artistic. Some of my favorite folk art comes from Mexico, in particular I love Hojalata or Tin Art. Hojalata has a wonderful mix of color and texture. 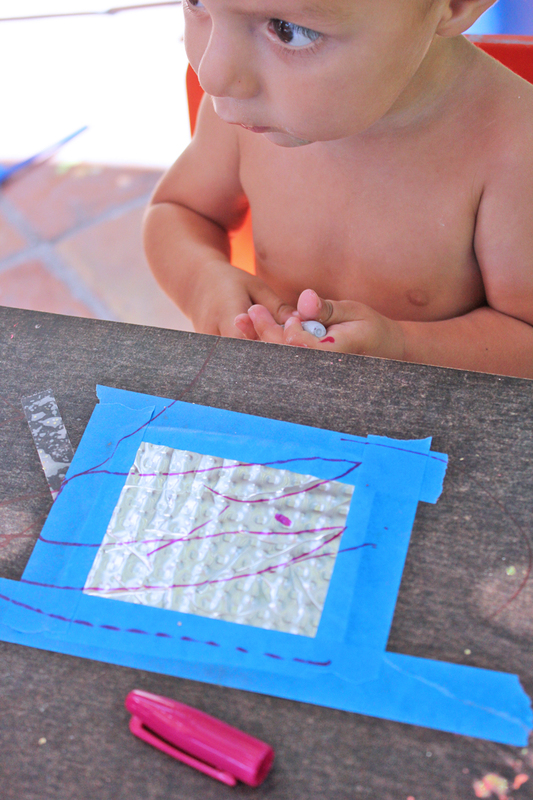 Typically hojalata is made by stamping and punching tin, today we’re going to kid-idfy the process using recycled aluminum and Sharpies! 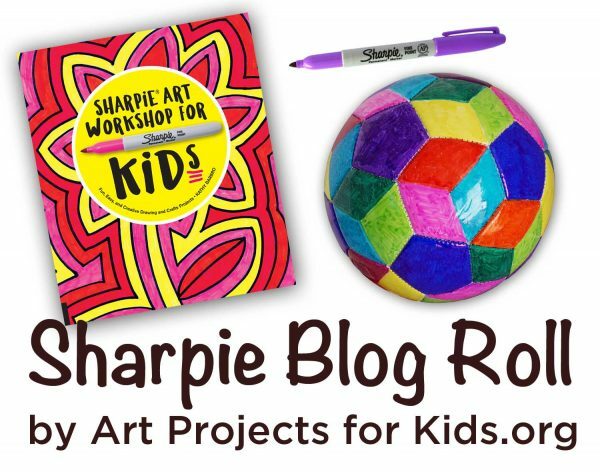 Today’s post is also part of a Sharpie themed blog hop celebrating the release of a wonderful new book Sharpie Art Workshop for Kids by Kathy Barbro of Art Projects for Kids. 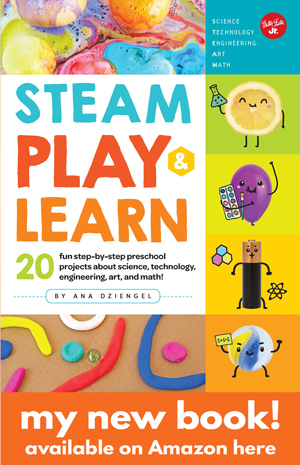 GIVEAWAY: If you’d like to be entered in a giveaway to win a free copy of this awesome new book, hop over to the Art Projects for Kids Facebook page to enter. 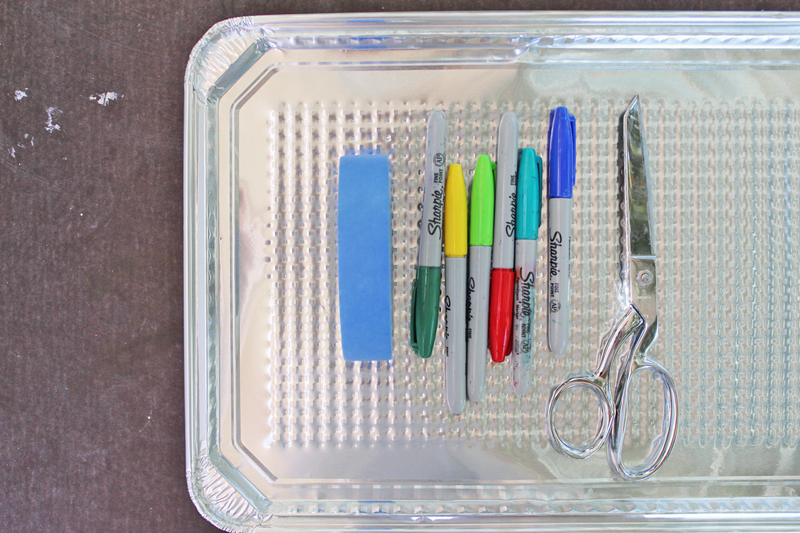 Disposable cooking sheet or pie plate– SAVE YOUR PIE PLATES this Thanksgiving! 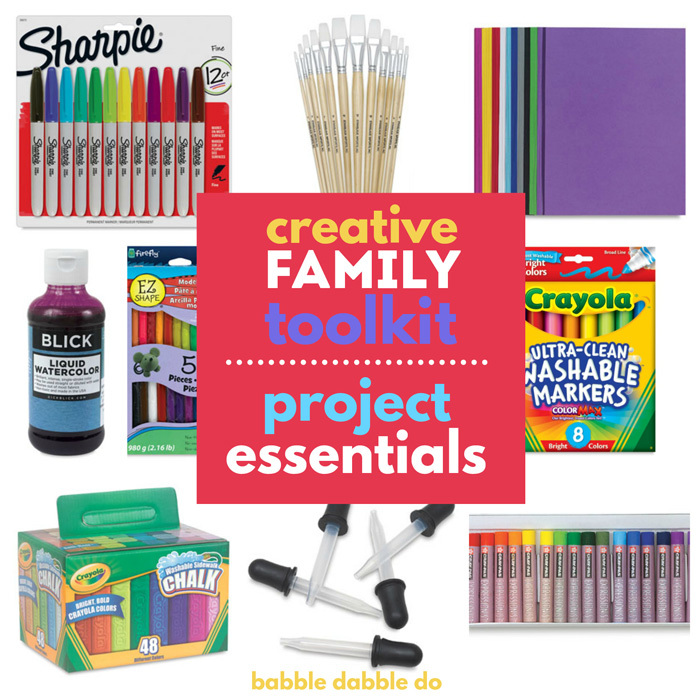 They make the perfect base for this project! 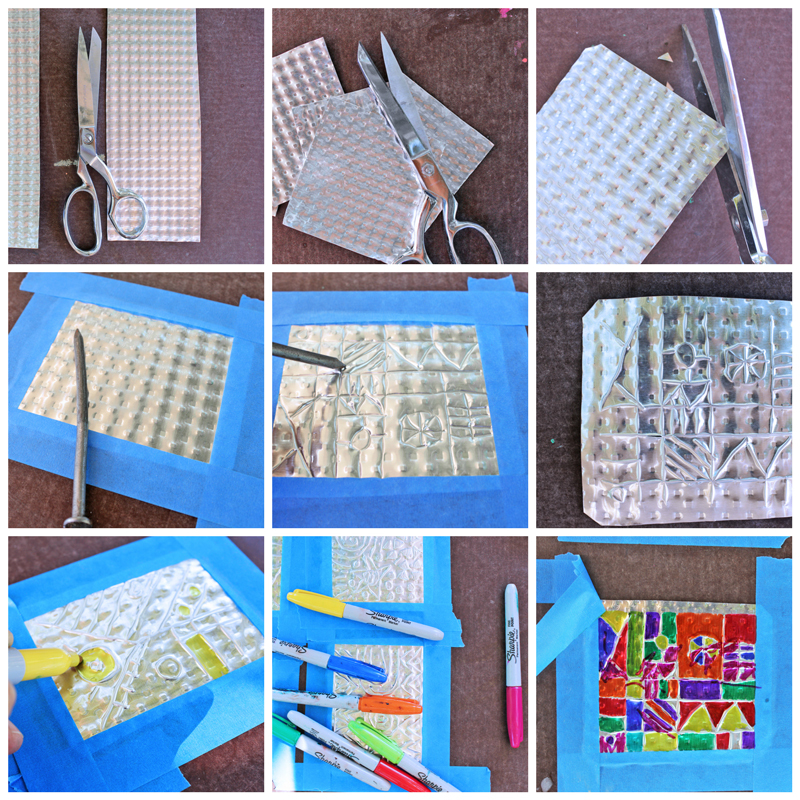 If you don’t have recycled pie tins or cookie sheets available, these foil lids would be an excellent base for the project. Step Two Trim the corners of each mini sheet to prevent sharp edges. Step Three Tape the aluminum sheets down to the work surface. The aluminum tends to buckle and deform as it is embossed. 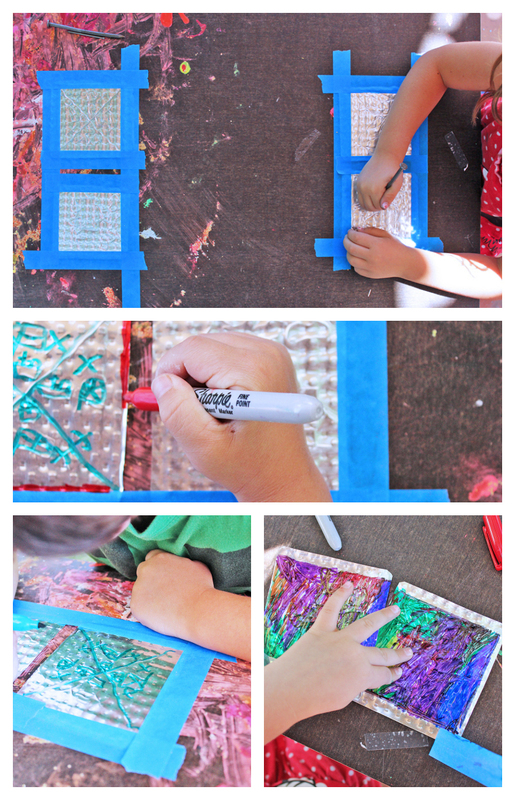 Painter’s tape will secure it in place and protect hands from the metal edges. Step Four Start “drawing” on the alumnum using the end of a nail. Be sure to press down hard to make an indentation in the metal. Step Five Continue making an embossed design until you are satisfied. Remove the painter’s tape. Step Six Turn the sheet over, tape it down again, and use Sharpies to color to the design using the embossed relief as borders for the color. Step Seven Remove tape and display! Well wasn’t that easy? Here’s my kids making their art. Embossing. Embossing is an art technique that involves stamping or punching a material to form a 3D imprint or relief. The two materials typically used for embossing are paper and metal. You’ve probably seen embossing used on the last wedding invitation you received! The art of embossing in metal is also called repousse. As I mentioned at the beginning of this post hojalata is a type of embossed folk art from Mexico; one of the primary things that makes it stand out from other forms of embossed metal art is the color. Typically embossed metal is left in it’s natural state but in hojalata the embossed surface is painted in very colorful hues. 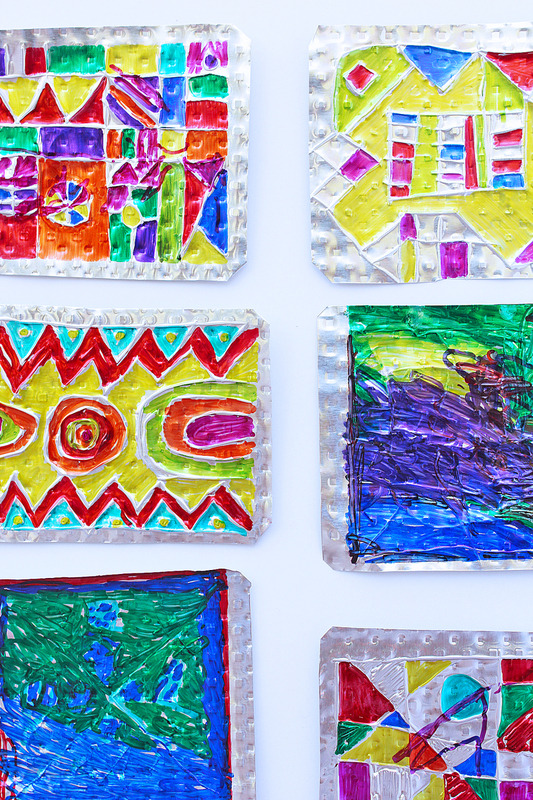 Tin is also considered a cheap type of metal and is sometimes referred to as “poor man’s silver,” thus making it a perfect candidate for folk art. If you have a chance to visit a store that sells Mexican art and imports be sure to take a look at the tin art, it is often combined with religious and humorous symbols. Now who said they weren’t creative? 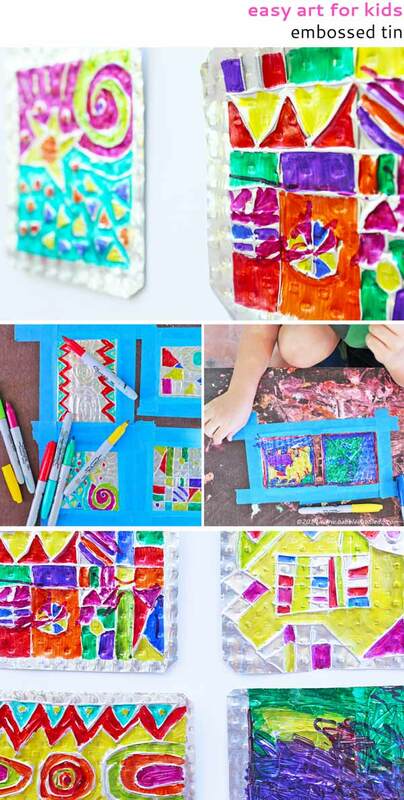 Hojalata is a folk art project for kids that explores working with a combination of unique materials and will really get them thinking outside the box. Plus it will help even your shy creators realize that making art isn’t about training or talent, but about seeing the world through your unique lens and expressing it in something you make. 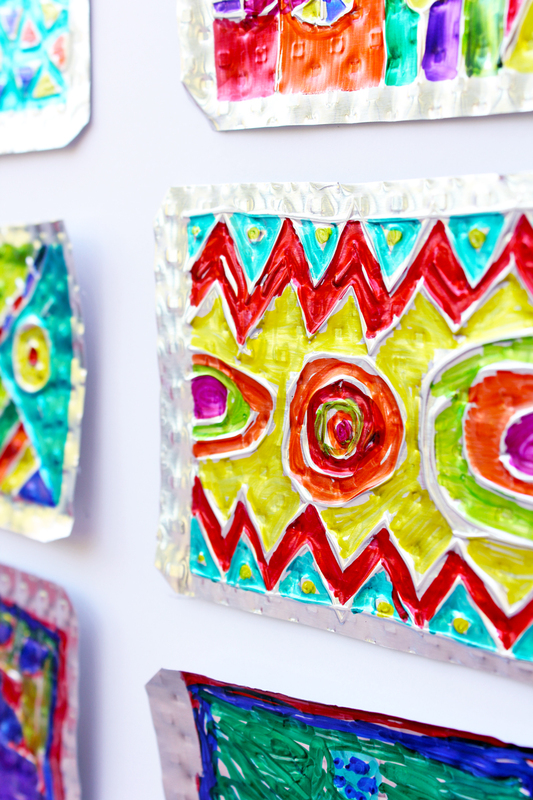 Embossed tin art is suitable for young kids and the level of detail and finesse will increase with age. My 5 year old didn’t really understand the idea of using the embossed lines as guides for the color but my 7 year old was ready for that concept. And of course my toddler had to get in on the action; the image below was taken before his torso became covered in Sharpie! 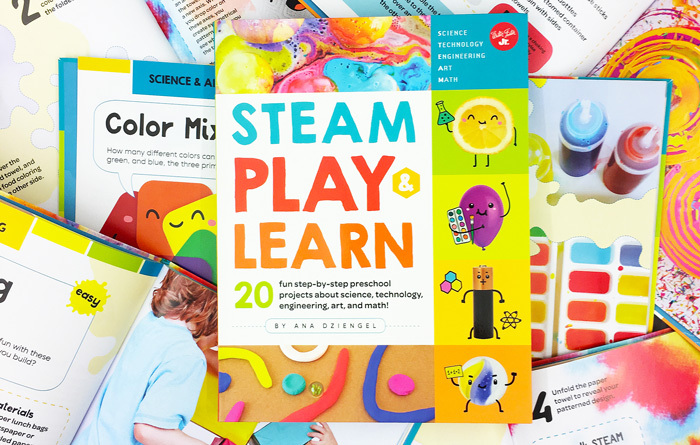 Nurture even reluctant creators through easy, magical art & science projects! Those look wonderful – so pretty! Thank you so much Faigie!